If you are travelling on a budget and want an all-inclusive destination that is cheap but well placed for both a fine beach and local attractions, you should consider Villa Islazul La Mar hotel. Villa La Mar is located just across the street from a beautiful white sandy beach and right in the centre of the Varadero strip, within easy reach of its many restaurants, bars, shops and markets. Islazul Villa La Mar has a colourful, bright reception and lobby area, with well kept pool and grounds. 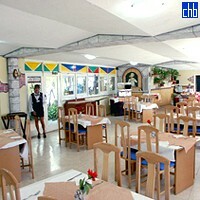 The hotel’s buffet restaurant continues the bright, airy theme and serves a good variety of food, while there are 3 bars (one serving free drinks from the beach), a snack bar and a la carte restaurant. Villa La Mar has daytime activities, mainly in or around the pool, and also evening shows for guests of all ages. In addition to the main pool there is a separate children’s pool, while other activities include volleyball and basketball. Islazul La Mar has rooms over four floors and it is important to note there are no lifts so it may not suit guests with limited mobility, unless ground floor accommodation can be arranged. It may be a cheap and cheerful 2 star hotel but Villa La Mar hotel provides good quality all-inclusive accommodation, good food and enough activities to keep you entertained during your stay. Better still, Villa La Mar provides a great base for taking in the vibrant sights and sounds of Varadero, providing a memorable holiday for travellers of all ages. 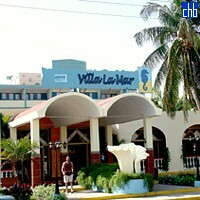 Villa La Mar has 218 standard guest rooms that are clean and well lit, with blackout drapes for those who need extra sleep. 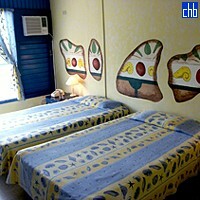 All rooms are ensuite and either have twin or double beds with satellite TV and air conditioning.